Sliced bamboo ("Nor Mai" in Thai) is found in many different Thai recipes, including our recipe for Frog with chile paste and Kaeng Jeut Nor Mai. Sour bamboo shoot has a particular aroma, stronger than bamboo shoot that's not sour which we also offer. The big 32 oz jar allows for generous use. Some chefs use it right out of the jar, others rinse and boil it for 5 minutes first, then drain and use as desired. 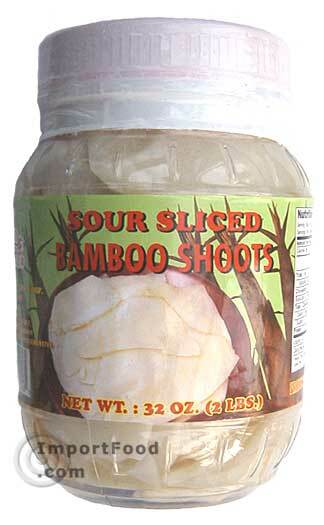 Ingredients: bamboo shoots, water, salt, distilled vinegar and sodium metabisulfite. Product of Thailand. Since starting ImportFood.com in 1999 we've featured hundreds of Thai recipes and street vendor videos, but not nearly enough attention has been given to recipes that use bamboo shoots. Here's an authentic Thai recipe that highlights the flavor of sour bamboo shoots. Lovers of authentic Thai recipes, please try this. You might want to cut the bamboo slices into smaller pieces, up to your own preference. Frog can be seen in markets across Thailand, and they're enjoyed in a variety of traditional Thai dishes. We prepared this recipe based on a northeastern frog curry, and it's going to please adventurous eaters as well as just about anyone who likes to eat coconut curry. See the pictures below of the steps involved and the final product. A fragrant, light soup that's full of flavor.